Grandparents are important to grandchildren in so many ways. Not only do you have the time and patience that’s the envy of their busy parents, but you’re best at spoiling them, too – and they love you for it! Saving for your grandchildren could be something that you’re thinking of and, if you are, I suspect that you’re not alone. With recent news that young homebuyers need to more than double their earnings to borrow enough to pay for an average starter house, you can’t help but think about what adult life will be like when your grandchild is starting out. There are many ways to begin saving for their future. We know from our own research that many parents want to invest for their child but remain in control of the money. So it seemed logical to us that grandparents might want to be able to do this, too! My Grandchild’s MoneyBuilder (ISA) from Scottish Friendly is designed to enable you to do just that. So you can give them the money when you think they need it most. With My Grandchild’s MoneyBuilder (ISA), you can invest for them using your own ISA allowance from just £10 a month. You’re entitled to save and invest in two ISAs every year, so you can have an Investment ISA with us in addition to a Cash ISA (should you have one), as long as you remain within your annual ISA allowance. A special feature of My Grandchild’s MoneyBuilder (ISA), is that once set up, you can add as many policies as you like to it (which we call ‘pots’) and name them for each of your grandchildren, provided you remain with your annual ISA allowance. That’s if you’re lucky enough to have more than one grandchild and, if you do, it could be costly. That’s why investments into My Grandchild’s MoneyBuilder (ISA) start from just £10 a month. Scottish Friendly think investing should be accessible to everyone. So investing for the grandchildren isn’t something that’s only for ‘one’ with a larger amount to invest. By giving your money access to a wider range of investments than a secure cash account alone, it could give it a better chance to grow into a nice cash sum for your grandchild over the long term. Of course, as with all stock market investments, your investments can go down as well as up and you could get back less than you have paid in for them. Tax treatment depends on individual circumstances which can change in the future. Scottish Friendly has been helping grandparents save and invest for their families for over 150 years. As a mutual with no shareholders, Scottish Friendly works as hard as banks and building societies but it’s to deliver potential returns for you and your family. Why not see what we can do to help you invest for your grandchild today. 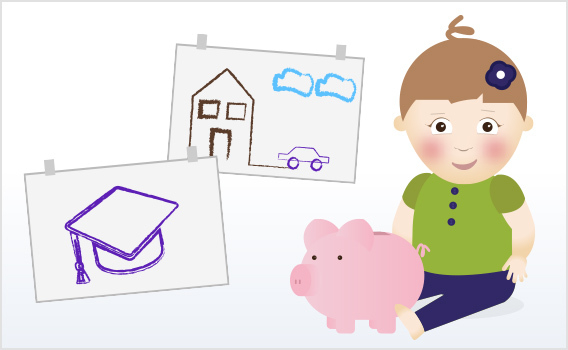 We also offer Junior ISAs for parents looking to save for their kids future.